Target alert! Yes, another limited edition product from Ben Sherman, producing an "authentic style" bowling shoe (which always seem to be in demand by someone) – then being unable to resist slapping a target on the side. If that appeals to you, these are limited to just 700 pairs each worldwide and effectively look every bit the real bowling shoe, with the red, white and blue colour scheme and full lace-up. And they also come with a free BS-logo bag. 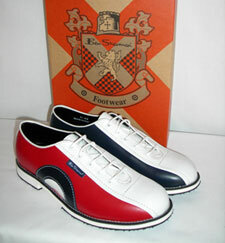 Whether you like these will obviously depend on your stance towards targets and bowling shoes. If you’re positive about both, they retail for £55. This is more commercial shite, that we used to call ´plastic mod´. Lambretta clothing, target alarm clocks, parkas with pre-printed graphics. Not what mod is about, at all. Could Graham Mansfield give us a lowdown on what it IS OK to wear? I havent bought a pair of these shoes by the way but I figured by the styling of them they are going to appeal to a limited market who are interested in the ‘mod’ look anyway, much like the original items of the 60’s and 70’s that are so coveted now. Surely ‘plastic mod’ is nothing short of snobbery in a scene we should be trying to bolster not shoot to pieces. Hot shoes! How do I leave a track back to your blog? ?